Are you searching for the best kayak tackle boxes for your fishing needs? A kayak tackle box is an important component to have every time you want to go for your fishing trip. It comes in handy for storing hooks, reels, baits and other fishing equipment. 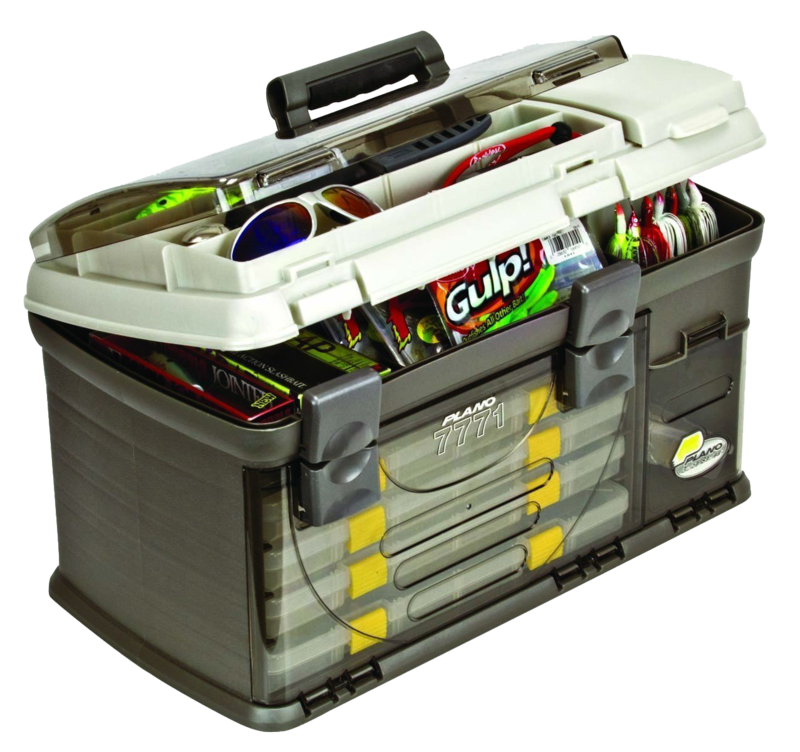 Tackle boxes come in different sizes and shapes but some are better suited for anglers. Apart from the gear, a good quality tackle box that will help you get organized and minimize chances of forgetting other essential fishing equipment is a must-have for anyone going for fishing. Therefore, it is crucial to choose a well made box with sufficient compartments to ascertain all your equipment remains organized and safe. Every angler has their preferences and applications when it comes to using tackle boxes. However, it is good to ensure you consider the flexibility, robustness, versatility, and user-friendliness of the box. 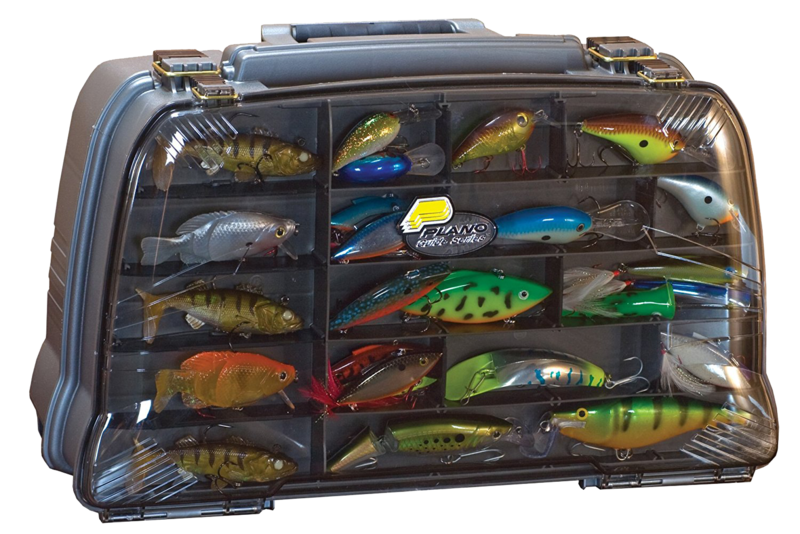 Unluckily, the market is saturated with plenty of tackle boxes thus making it difficult to choose one that will meet your unique needs and applications. However, our kayak tackle boxes review below outlines some of the best kayak tackle boxes for fishing. The Plano 7771 tackle box is the best in the market today for fishing and comes with a clever tackle system and a lifetime warranty to give you peace of mind. 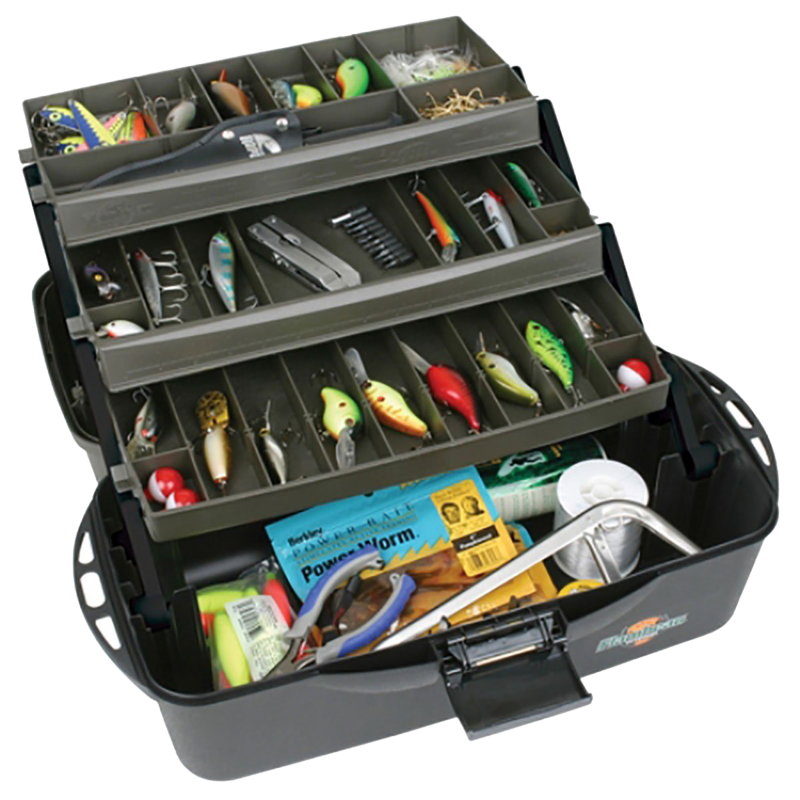 This tackle box is popularly used by professional anglers as it offers a spacious storage solution. With this tackle box, you can store a lot of tackle. It is designed with three racks that are removable from the box, which makes it suitable for quick access when fishing. The good thing about this tackle box is that it can also accommodate larger items such as reels and line below the top storage. However, the weight when heavily loaded would make it suitable for short distance fishing or placed in one place on a boat. When it comes to carrying and moving around with this tackle box, the PLANO Tackle Systems Hybrid Hip 3 Tray Kayak Tackle Box features a comfortable over molded handle so it’s easy to move around with it. The Plano 7771 is one of the large fishing tackle boxes that can accommodate almost all of your favorite tackles. Another incredible benefit with this tackle box is the lifetime guarantee that you will get so you don’t have to worry when using it under heavy usage since it is covered. In fact, it is the best tackle box for serious fishermen. 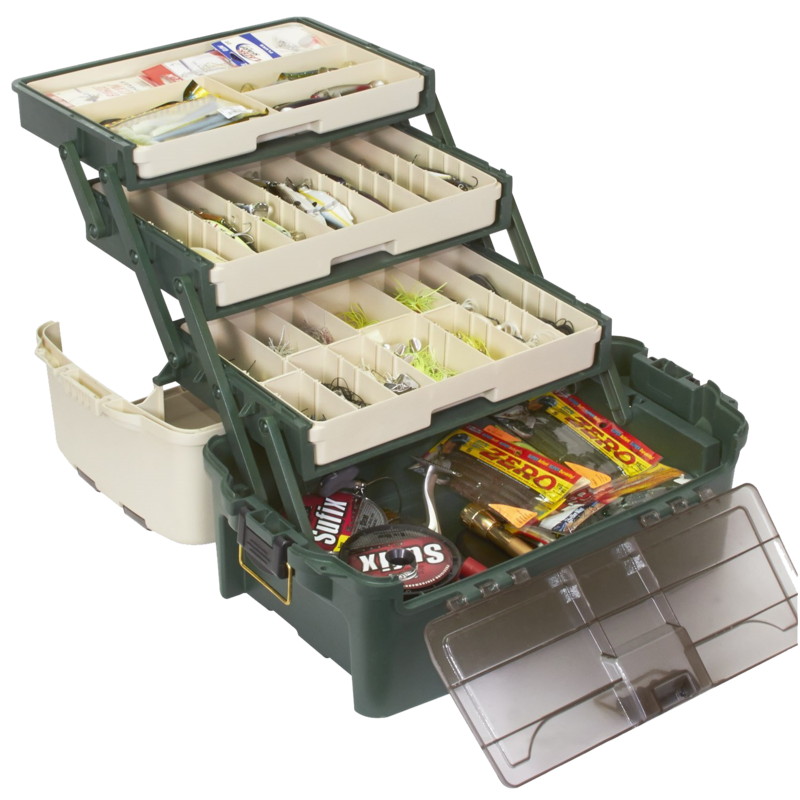 Plano 1444 Magnum is a best compact tackle box with a 4-layer storage system making it perfect for bulk storage. The 4- layer system includes spinner bait bottom racks and specific storage under the top lid. The good thing about this tackle box is that it comes with a lifetime warranty and overly versatile thus giving you the flexibility to carry a lot of gears that you will need in your trip. This tackle box can carry hooks, lures, weights, sinkers, reels, lines and more so you will always have what you need for your fishing tasks. The inner part of the box is designed in a way that it provides sufficient storage space for all the tools you will require on your fishing trip. It is designed with easy to grip handle and is less bulky. Besides, the Plano 7771 Kayak Tackle Box is made from high-quality materials, which make it durable so you can be sure it will last for more seasons. The Plano 1444 Magnum is perfect for both professional as well as new anglers and is adaptable to different fishing situations. Incredible hinges so it’s easy to open and close. Numerous compartments to store plenty of items. Well-organized multiple layers to keep all your gear organized. The shipping facilities are somehow poor but the manufacturers are working on to make it perfect. Coming from Flambeau, this is an all-weather, worm-proof material designed for a fishing tackle box that features numerous functionality for anglers. It comes with spacious storage space and comes with exceptional features such as tip-guard support and water-resistant construction. The Flambeau Tackle Box comes with 3 large detachable trays with up to 37 compartments thus making it easier when it comes to managing the tackles. The bottom tray features sufficient space that can accommodate a lot of tackles as well as other accessories. The good thing about this tackle box is that the dividers can be detached so that you get more options. Another incredible thing about this tackle box is that it is water-proof and its fitting is also remarkable. This tackle box is suitable for serious anglers and a good kayak tackle box. The interior is sturdy making it capable of holding large amounts of heavy equipment for your fishing trip. Pro Tip: Tackles on the picture are not incorporated in the box. Numerous compartments of different sizes to manage your equipment in an organized manner for easy access. The plastic material makes it not suitable for frequent usage. Dividers need frequent supervision since they can get loosened with time. Coming from Frabill Plano, this is one of the best Kayak tackle boxes out there to keep your gear dry and safe. It’s a convenient tackle box that is designed with a secure lid that is capable to snap in place perfectly to prevent your tackles from falling. This makes it perfect for anglers moving around or in tripping situations caused by turbulent waters. It comes with great security features including Dri-Loc O-ring seal together with 3 fitted-sealing Cam-action latches. The Plano comes with incredible 4-15 adjustable compartments that are spacious to hold large items such as crankbaits. This tackle box also comes with permanent dividers and inserts to help you customize the storage according to your preferences. The bottomless design makes it suitable for holding your entire gear essential for your fishing trip such as lures, bait, line, leaders, weights and more. It’s water resistant so your gear stays dry and secure even when your kayak tips over. Not suitable for new anglers since the 3-phase latch system is tough to open. Permanent dividers and inserts have some limitations when it comes to customization of the storage option. This is an updated version of the classic tackle box and comes with an innovative design features to hold all your tackle in an organized manner for easy access. Coming from a Plano a company that is popular when it comes to construction of quality tackle boxes, the Plano Tackle System Hybrid Hip 3 Tray box is designed with high-quality materials thus making it strong. When fishing an angler uses different types of gear and it’s good to ensure you can access them easily when you need them. 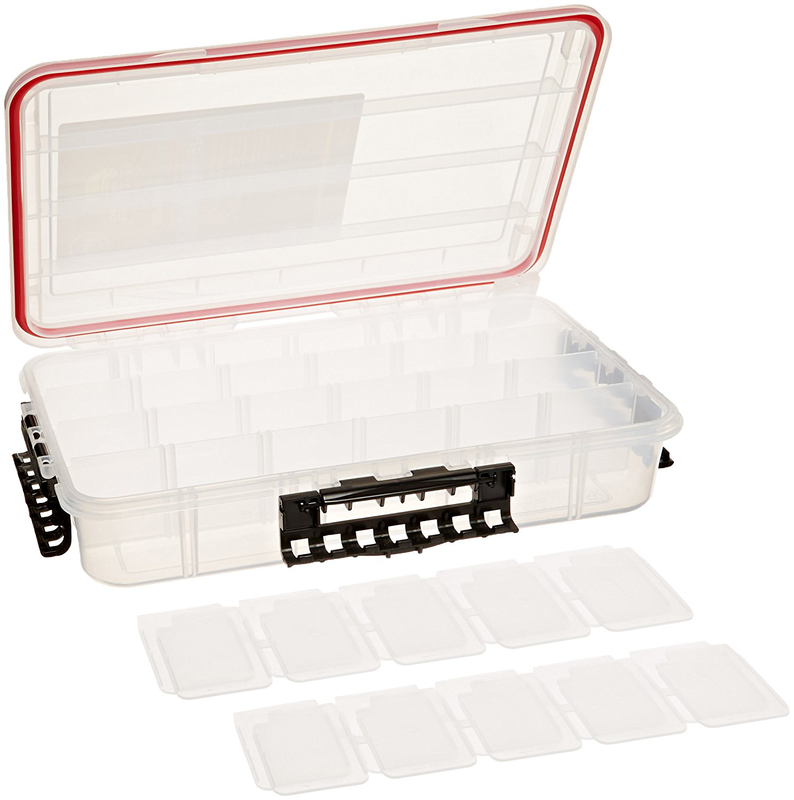 With this tackle box, you are provided with fast and easy access to all your gear. It comes with a large storage room to hold large tackles. When it comes to choosing the best kayak tackle boxes, you need to consider some important factors as listed below. Tackle boxes are made of two different materials; soft and hard. Soft tackle boxes are made of nylon material and hard tackle boxes are made of plastic material. Note that when it comes to durability, tackle boxes made of plastic material take the lead. Also, they are normally designed with sufficient compartments but are quite heavy and sold at a higher price than those made of nylon material. The soft tackle boxes are sold at a low price and a lightweight. If you will be moving from one place to another with your tackle boxes, then soft material tackle boxes could be suitable for you. However, if you are looking for tackle boxes that will last long then hard tackle boxes are perfect for you. The main reason why anglers need tackle boxes is to protect all the equipment used when fishing from the water. Most of the fishing gear is made of metallic material. If you happen to tip over and water enters your tackle boxes this metallic made equipment could rust or wear out. The only way to overcome such situation is to buy a waterproof kayak tackle box. If you overlook this factor, it may cost you in the long run since you may have to buy some of the equipment once they are ruined. The main use of a tackle box is to store all your tackles while you are on your fishing trip. Note that you will need a lot of tools for your work and so you will need to store them in an organized manner so that you can access them fast and easily when you need them. Sometimes you might even forget some of the important equipment. To avoid these frustrating situations, you need to choose a tackle box that has adjustable slots, numerous compartments and trays and a safe seal. This will make you not to forget all the essential equipment for your fishing work. If you do not want to be running to the shop to buy something after some few days of buying it, you need to go for a tool that has a warranty. Ensure to choose one that has a longer warranty. 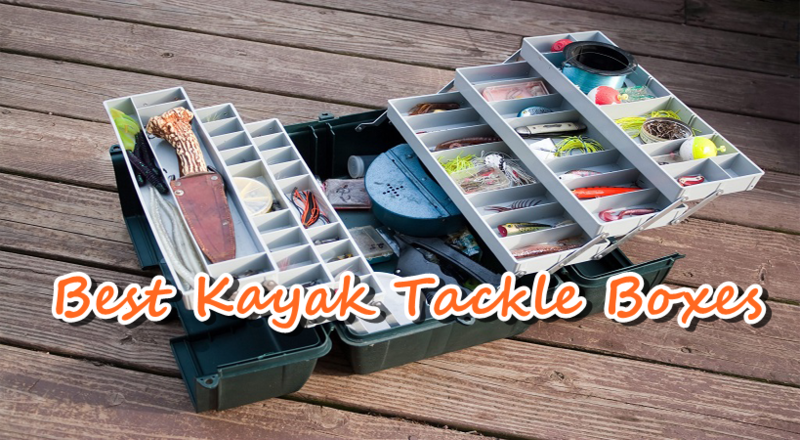 Kayak tackle boxes are designed in different sizes and shapes. It is good to choose a box that you can handle easily; not too big and not too small. The size of the box is of great importance depending on where you will go for your fishing trip. Therefore ensure the size of the box is such that you will be comfortable when carrying it around. Whether you will want to use your kayak tackle box when fishing in the ocean or you want to use it for leisure, you need to choose a tackle box made with good quality material, so that it can stay longer. As seen above, there are different types of kayak tackle boxes that are suitable for different uses. Each box has its own specific features that are suitable for your fishing needs. You should also ensure that the box is made of high-quality materials, is of appropriate size and offers some degree of water resistance. From the products mentioned in our kayak tackle boxes review above, which one is your favorite? Share with us in the comments section below.